After recent discussions with the ECB Hertfordshire Cricket are going to stop the County trial process and in future will assess cricketers over a much longer time frame. This means as of next year (2019-20) there will be no trials for any boys age groups. The trials process for this winter (2018-19) has already taken place. 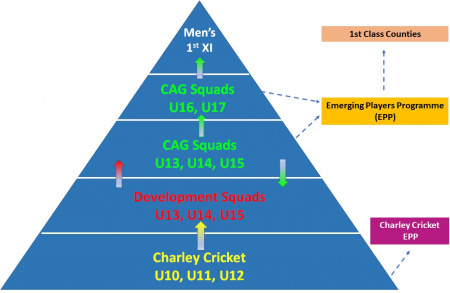 Players will be continually assessed from the start of the Pathway (Charley Cricket) through to the Men’s first XI. Ideally players will start on the pathway at Charley Cricket so they are assessed over the longest possible timeframe so the coaching team can develop better understanding and relationships with them. From September 2018 the occasional player who was not part of Charley Cricket in previous years or is beyond the age of U13 will only be able to be nominated as an anomaly via an online form on our website. There is no guarantee all nominated players will be seen. Those accepted will be invited to at least three Development sessions (winter or summer) for a more longitudinal assessment for selection to the Development programme. The Development programme is the sole feeder to the CAG programme and players can be moved up and down between these programmes and both parents and players need to be flexible about what suits best their development at that time. Two boys of similar age can be 18 months advanced or behind in physical or emotional development. That could be 3 years difference. If two players are born at different ends of the academic calendar that could be 4 years difference. The pressure of acute snapshot trials can also put many children off cricket and does not allow all to demonstrate their full potential. Of course, selection and non-selection is part of a child’s development but it is important we minimize selection anxieties. Assessing over a much longer time frame allows a greater understanding of each individual and more informed decisions can be made to benefit each child.